Cappadocia: rock formations beyond belief in Devrent valley; visit to Pasabag "fairy chimneys" where the voice of wind mixes with the "songs of fairies". Pasabag valley contains some of the most striking fairy chimneys in Cappadocia with twin and even triple rock caps. This style is unique even for Cappadocia and these fairy chimneys are named mushroom shaped fairy chimneys. one of the most interesting underground settlements in Cappadocia. People of Kaymakli (Enegup in Greek) village have constructed their houses around nearly one hundred tunnels of the underground city. The inhabitants of the region still use the most convenient places in the tunnels as cellars, storage areas and stables, which they access through their courtyards. Kaymakli Underground City has low, narrow and sloping passages. While the city has 8 floor, only 4 of them are open to the public today, in which the spaces are organized around the ventilation shafts. Same day in the evening, transfer to Kayseri Airport to take the evening flight to Istanbul Ataturk Airport. Upon arrival in Istanbul, transfer to your hotel. 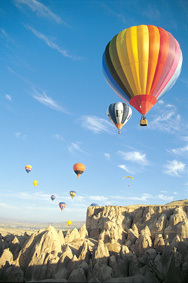 Experience the magic of a balloon flight and let the world below drift away. Feel the exhilaration of morning-fresh country air. Every flight is a fantastic adventure as you float intimately amongst the fairy chimneys and soar over the magnificent Cappadocian landscape.